New London County is the one county on the Northeast Corridor that hasn't been fully grade separated. The New London Station itself has a grade crossing running down the middle of the station platforms and there are a few others near by. This means that all trains, including Acela Express, where all but two northbound trains and weekdays and one southbound weekday train (there is currently no weekend Acela Express service stopping at New London) skip the station, must slow down to a crawl to pass through on the curvy track with the single quad grade crossings. 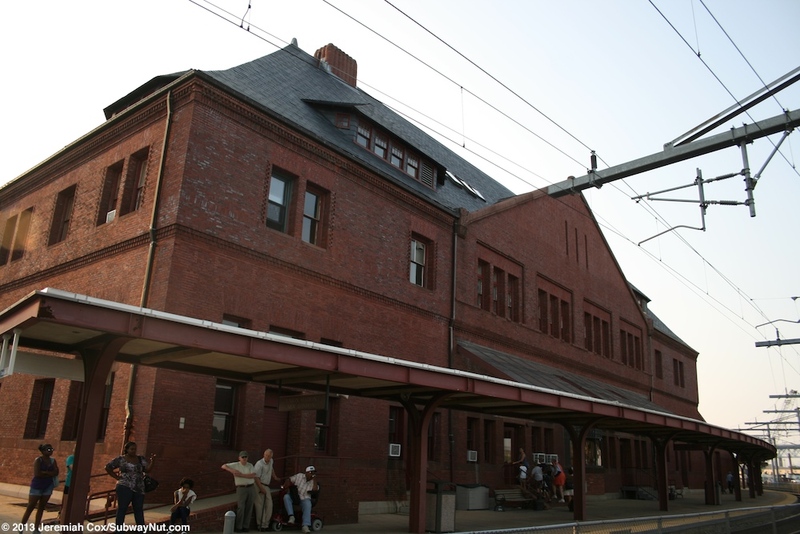 Other than the lack of Acela Express Service, the station is an important stop on the northeast corridor with all Northeast Regional trains stopping in the station. 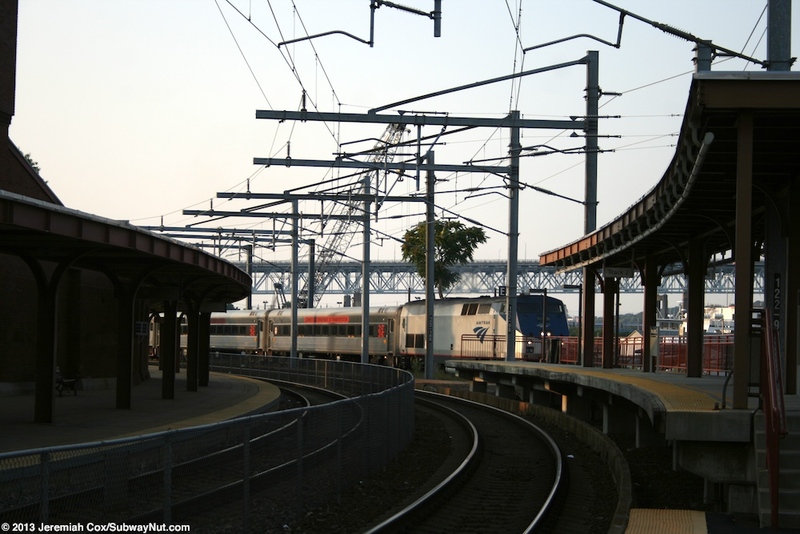 Acela Express couldn't have any trains stop at New London until the Fall 2001 timetable (it first entered service in December 2000) because the high-level platforms weren't completed and still under construction. 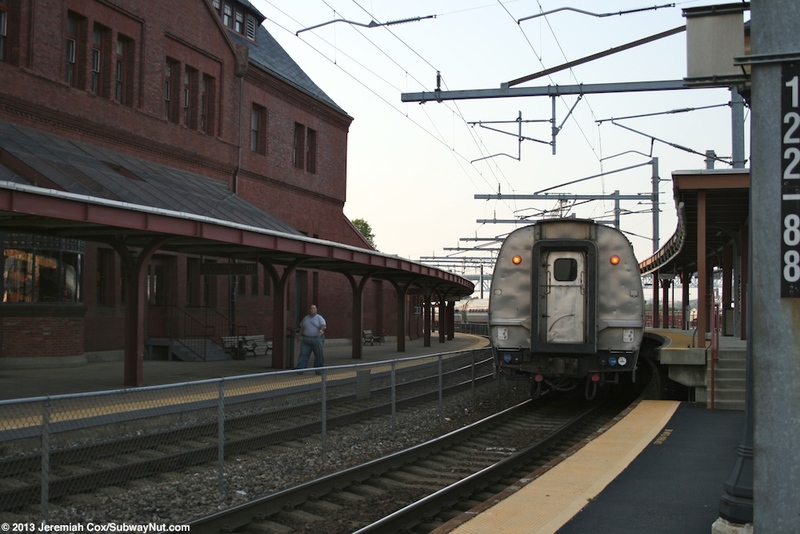 Acela Express trains lack steps to exit the trains at low level platforms and are only able to stop at high-level platforms. 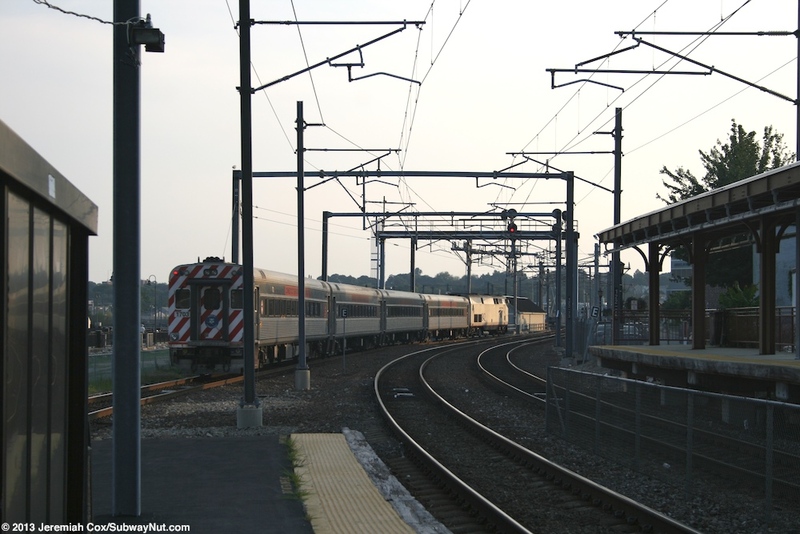 In August 2001, I remember vividly taking an Amtrak Acela Regional to Westerly and hearing various New London-bound passengers complaining that they couldn't try Acela Express. 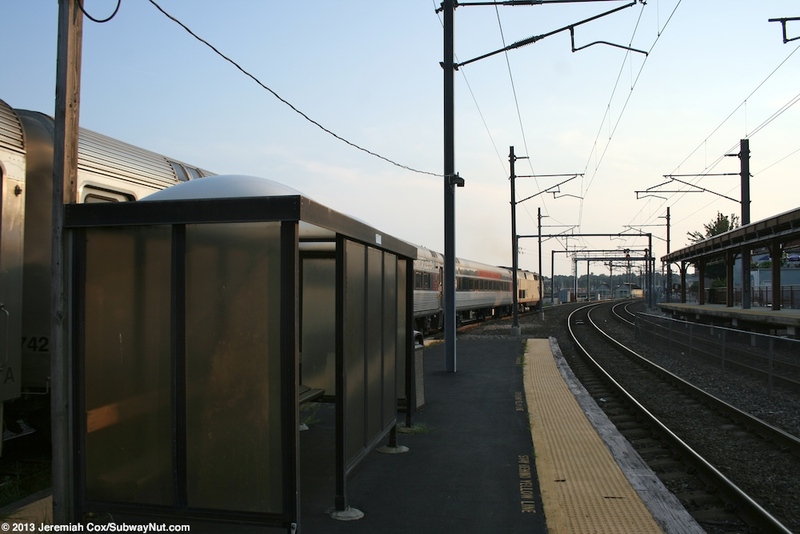 This characteristic of Acela and the fact that New London only has a very short portion of each platform (for a car or two) that is high-level means that it is the only stop Acela stops at where the doors of only one car can be opened. 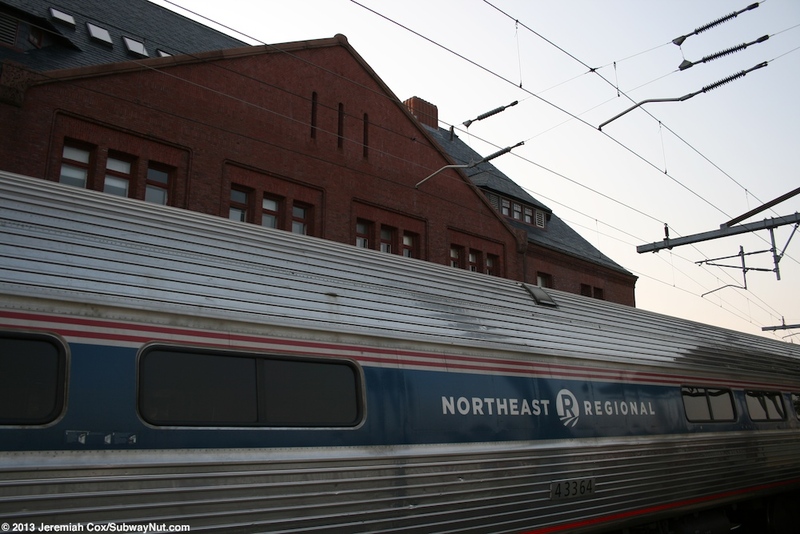 Northeast Regional trains crews normally open a couple of doors, some at the high-level portions of the platforms and other along the low-level platforms. The station staff will even announce, telling people where to wait such as for a southbound train: "Passengers in Business Class and wanting the Quiet Car wait on the high-level platform, all others wait outside the station" (where the platform is low-level). 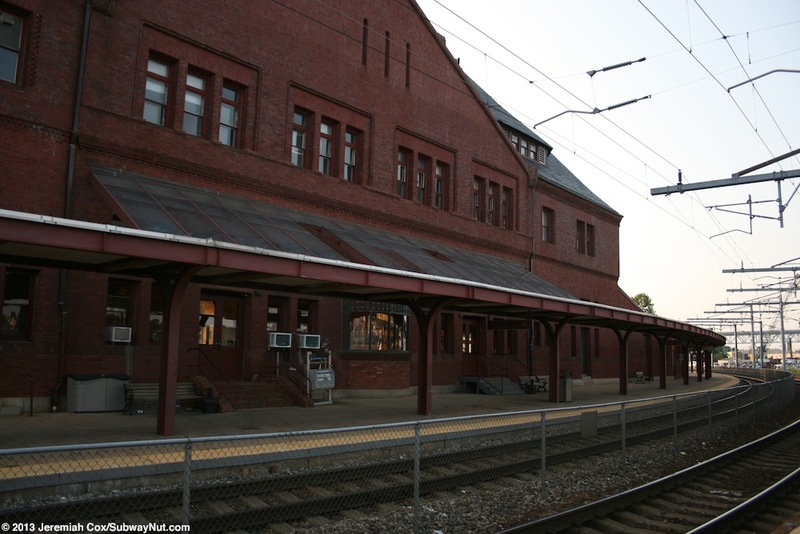 Commuter Rail service to New London is supplemented by Shore Line East from New Haven that has had a rocky history serving New London since two trains were extended from Old Saybrook on February 1, 1996. 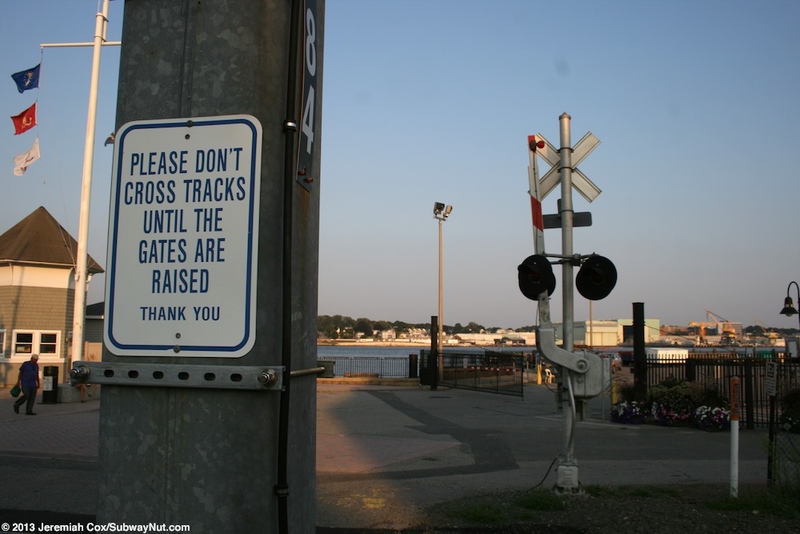 The reason for this is because of capacity constraints on the three drawbridges between New London and Old Saybrook, that limit train service to provide ample time for bridge openings for marine traffic on the Connecticut River, the Niantic River and at Shaw's Cove in New London. 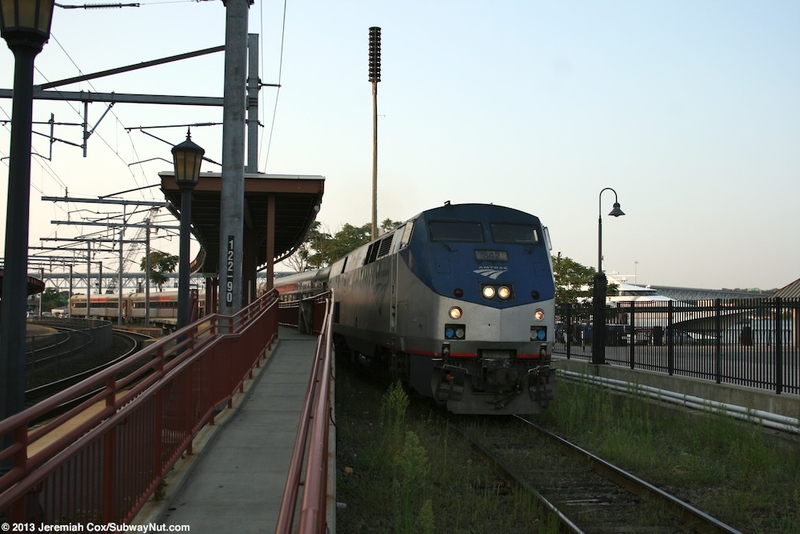 As part of Amtrak's expansion of service to and from Boston with the introduction of Acela Express on April 28, 2003, what were then 2 AM rush hour New Haven trips, and 3 PM rush hour New London-bound trips (with most trains accommodated by a return, express positioning trip in the opposite direction) were discontinued except for one evening PM New London round-trip. New London Commuters with monthly passes only were accommodated on rush hour Amtrak Northeast Regional trains to and from New London (one morning Amtrak train is the first train of the day an Acela Express, Shore Line East Monthly pass holders can ride the one stop as part of their daily commutes!). 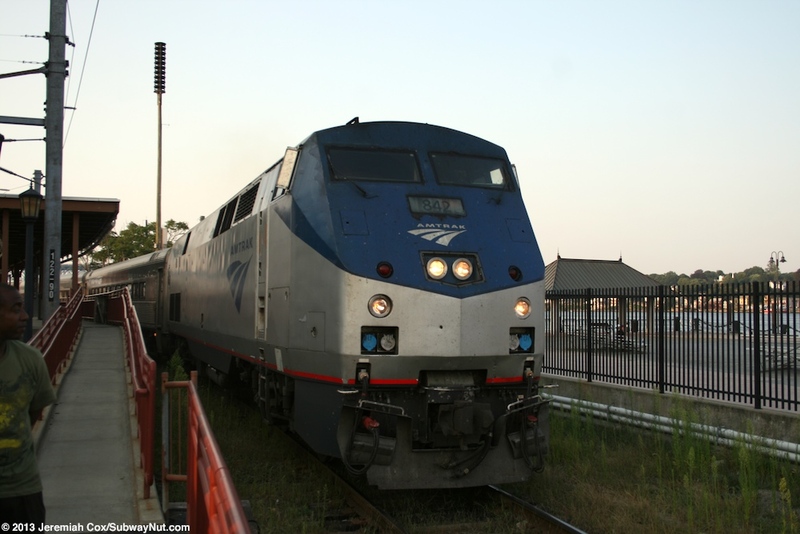 Occasional riders though were stuck paying Amtrak's much higher regular fares. 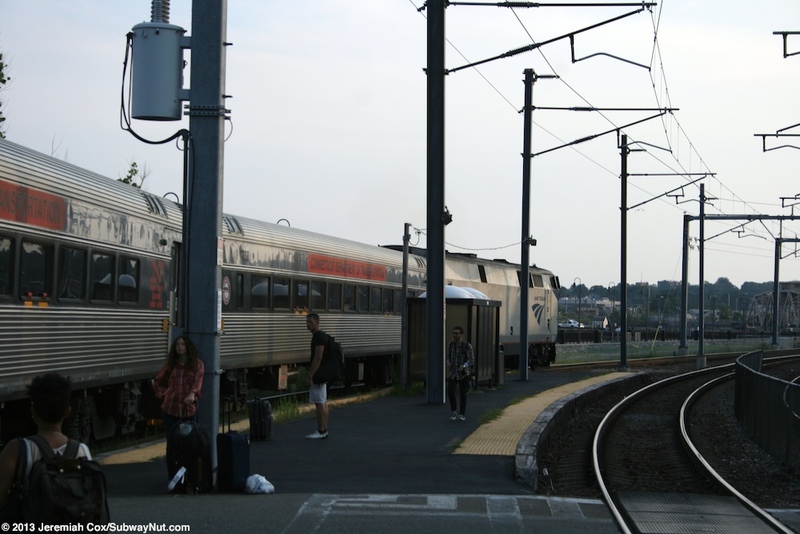 The ability of Shore Line East Monthly ticket holders (later expanded in 2008 to weekly and ten-trip tickets as well) to use select weekday Amtrak trains continues to this day even as New London now has regular Shore Line East service. 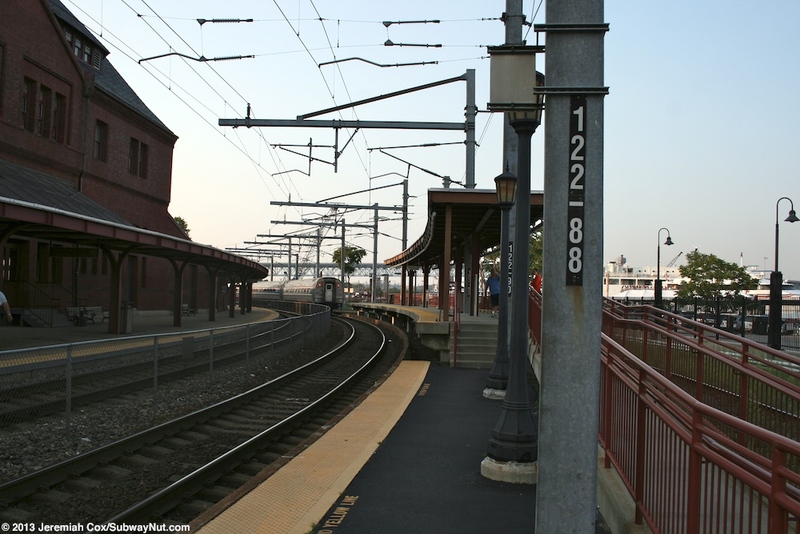 It took until February 16, 2010 for Shore Line East to add more service to New London with its own trains. The first this increase was extremely modest with just one more round-trip (restoring service from New London in the AM rush hour). 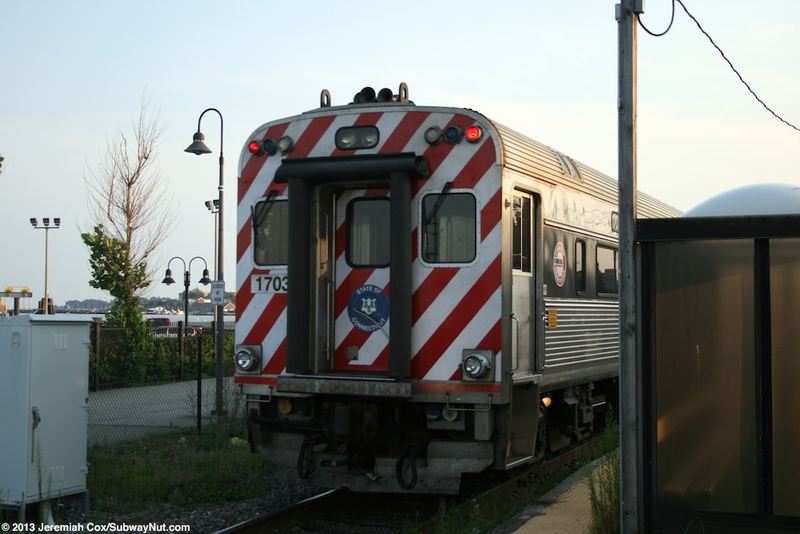 On May 10, 2010 this was increased to a total of five daily rush hour round trips. 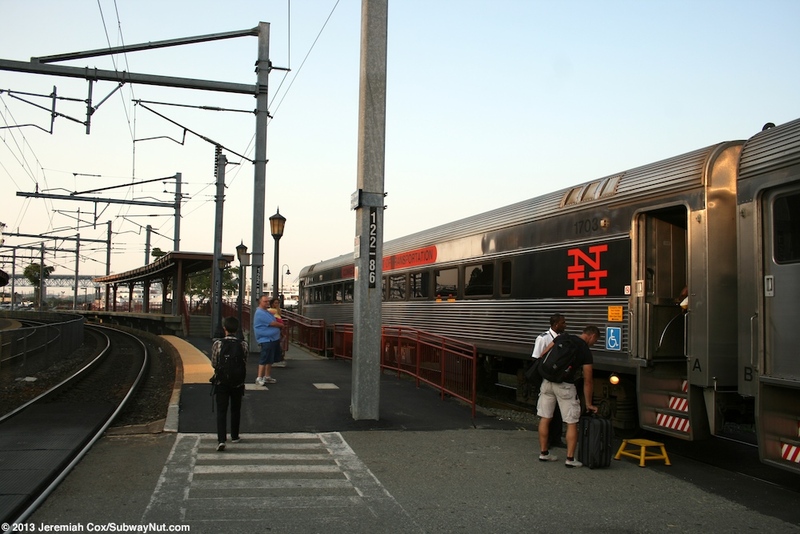 This service amount: two AM departures to New Haven (one arrival), and four PM rush hour and evening (3 returning) arrivals from New Haven continues to this day except for the addition of a midday round-trip (around noon) beginning in early 2013. Regular Weekend Shore Line East Service (special service to New London has operated previously to and from the annual Sailfest) was extended to New London, beginning on June 1, 2013 with 7 round-trips extended from Old Saybrook, more than the 6 daily round-trips on weekdays! The New London station itself is extremely intermodal, located on the waterfront along the estuary of Thames River at ground-level. 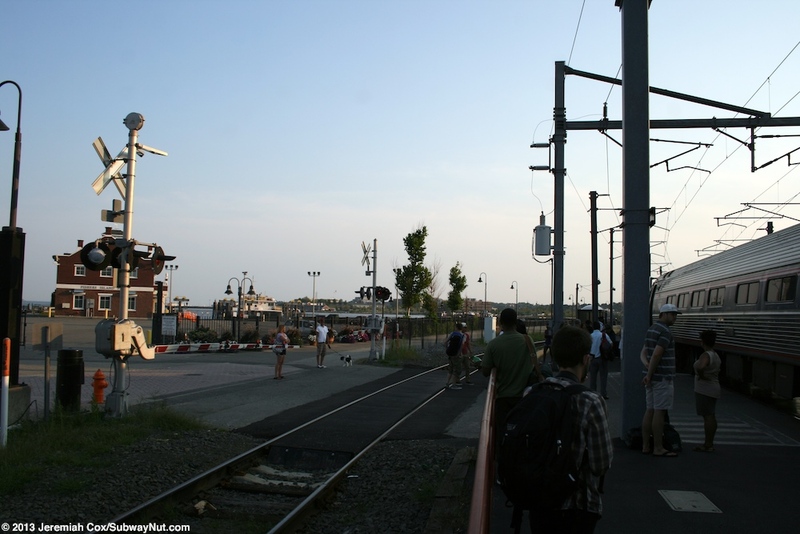 Directly across from the station (and visible from the tracks and station platforms) are docks used by the Cross Sound Ferry (that also accepts vehicles) to Orient Point, the seasonal Block Island Express (operated by the same company as the Cross Sound Ferry), and the Fishers Island Ferry, the only regularly scheduled ferry service to Fishers Island, New York. 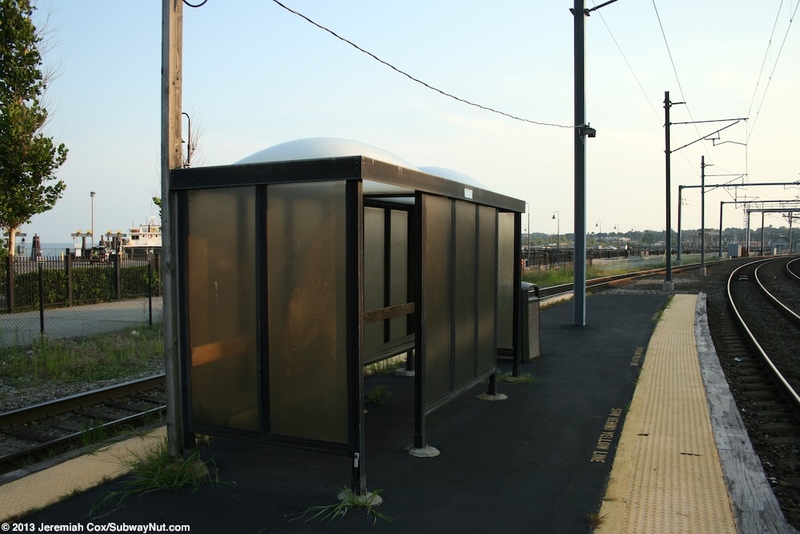 There is limited, seasonal and not daily service from New London to Montauk. 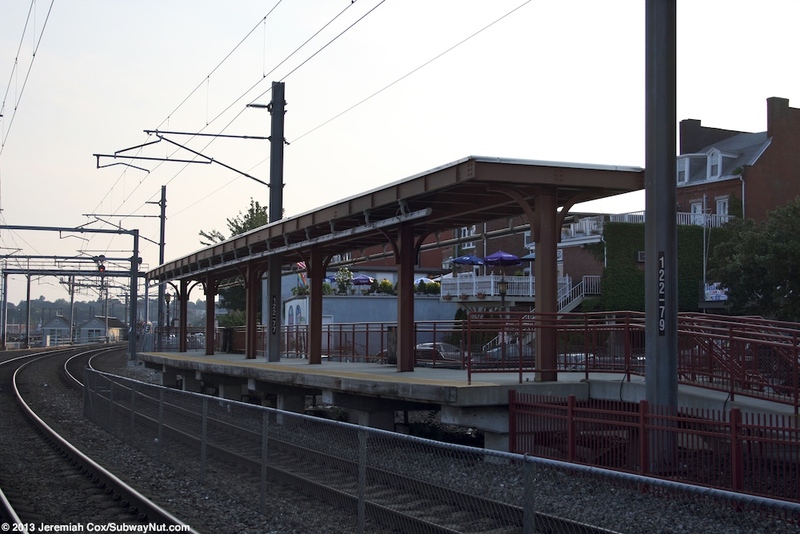 All passengers going to the ferries have to cross the Northeast Corridor at a grade crossing just north of the station or directly in the middle of the station platforms. 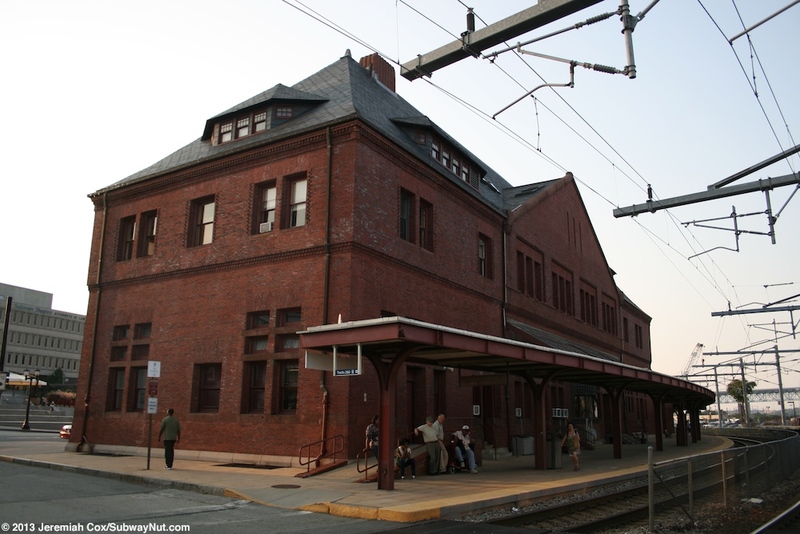 New London's Union Station is a historic 1888 station designed by Henry Hobson Richardson in the Romanesque Revival style. The imposing building is built entirely of brick and is two stories tall. 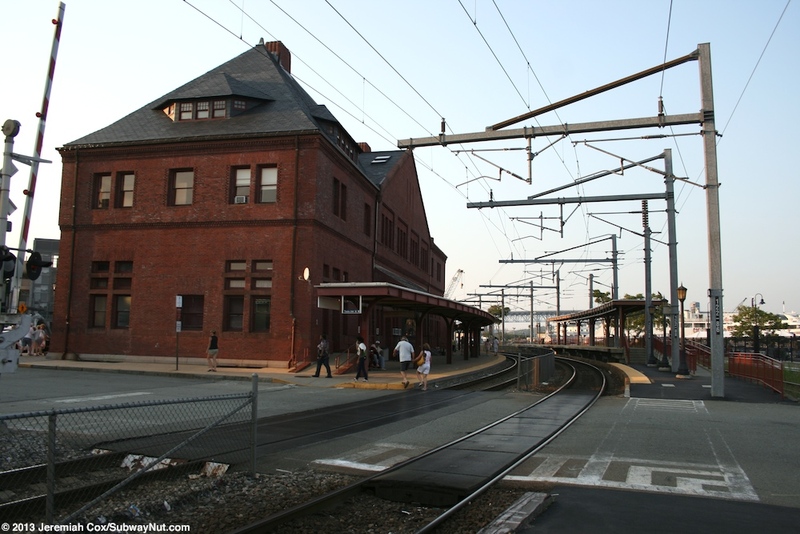 The station is long and narrow tucked between Water Street and the train tracks with State Street running along the short southern side of the station before it reaches its grade-crossing through the middle of the station platforms that leads directly to the waterfront along the station and ferry docks. Across Water Street from the station is a plaza with a modern sculpture of a whale fin Waling in New London that has cascading water from the tail. ( subject to controversy if it can be called a fountain because the openness of the water). Just north of the station and attached by canopies in what I assume is the former freight house is the small Greyhound Station for New London. The inside of the Greyhound station is nothing historic, just the standard bare Greyhound white attached chairs. For trains New London has three tracks and an extremely confusing platform arrangement especially because of the mix of high and low-level platforms, the fact the station is on a curve and the grade-crossing running through the middle of the station. The track closest to the depot is track 1, it is normally the New York and points south-bound track. It's low level platform begins at the depot and runs north, past the Greyhound Station and the three Greyhound back in and out bus bays north of the depot. The entirety of this platform has a canopy (with a secondary wider canopy over the ends of the bus bays) with pillars painted (like all at the station) a maroon color like the bricks of the station house. A modern tactile warning strip has also been added. 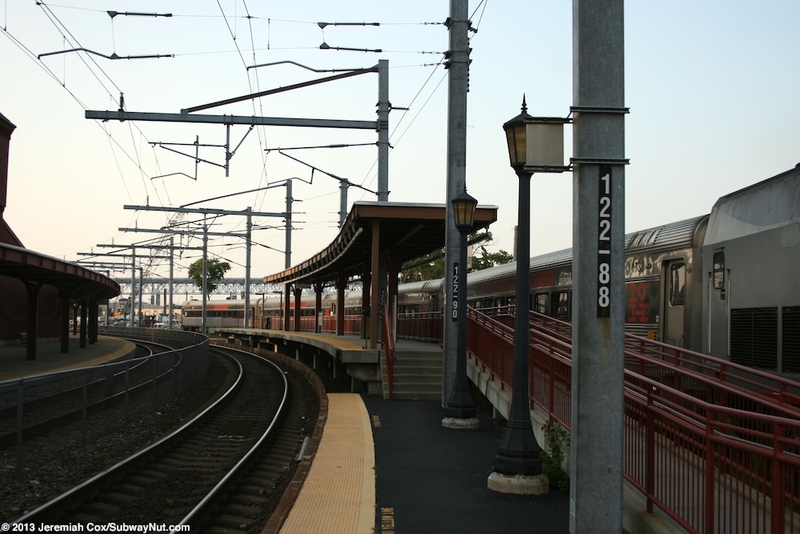 Across the grade-crossing, south of the depot is a small walkway with a fence and lampposts between the track and walkway that leads a short way to a gradual ramp and staircase up to the modern one car long high-level platform built to accommodate the new Acela Express trainsets at the southern end of track 1. Across from here are two more tracks. Track 2 is in the middle of the station and is the through track for Boston-bound Amtrak trains, there is finally Track 6 that is a siding track and used by Shore Line Eats Trains that terminate. Track 6 is NOT currently electrified although part of the plan to allow the use of M8s on Shore Line East would electrify it (and require modifications to the high-level platforms in New London since the M8 EMUs lack door traps). These tracks begin (south from the grade crossing) with a short, low-level island platform with tactile warning strips and a small double-wide bus shelter in the middle of it. The island platform goes through the middle of the grade crossing (no crossing devices, the gates and bells are on the opposite ide of track 6). North of the grade-crossing, across from the depot, a fence appears along Track 6 as the ramp up to the high-level platform begins along this track while track 2 continues low-level before abruptly becoming high-level with also a staircase. The high-level platform for Track 2 can accommodate about 4 cars, the southern two-thirds have a canopy. A fence is along the edge of track 6 except for a gated off, single short permanent bridge plate that in theory a door of a train on track 6 could open at. This high-level platform ends and the remains of the longer low-level platform it was built upon are still visible with concrete and tactile warning strips heading into the distance. The issue with making the high-level platform a full island is the outside of thee curve that track 6 would be along and there would be extremely wide gaps between the platform and trains (movable bridgeplates are probably the only solution to the doors of M8s. Shore Line East trains terminating in New London currently stop in the middle of the grade-crossing and open up one door directly down to the grade-crossing with passengers using a yellow stool to get on and off. For Amtrak trains stopping at the high-level platform along track 2 the wider than normal gap is a bit of a problem (but not extremely dangerous) and boarding an Amtrak train here saw a conductor grab a bridge plate stationed on the platform but the angle of the curve made this relatively useless. Inside the station is a plaque saying it was restored on July 29, 1976. This means the station didn't receive as quite a historic renovation as we've gotten used to with more recent restorations. Inside the building is carpeting, orange colored walls with some wood paneling and molding around the historic windows. There is a neat circular window made that looks out to the platform where a station agents office once was that has now been relocated. The ticket office has now been relocated to an unhistoric plexiglass inclosure in the southern corner of the station. There are a couple of windows with friendly agents selling both Amtrak and Shore Line East (Amtrak operates Shore Line East and Provides all ticketing) tickets, not trying to gear riders towards Amtrak when Shoreline is at least a cheaper option (overheard someone buying a ticket from New London to Stamford and asked which service). A black felt departure board lists both Amtrak and Shore Line East departure and arrival times in each direction. Behind the ticket office are restrooms through a corridor that have a bunch of Amtrak passengers only signs. The ceiling of the station is made of wood but non-historic 1970s simple circular light fixtures hang down from it to provide lighting. In the middle of the room is a small clearly defined waiting area with a number of Amtrak Passengers only signs. The area is framed by square wooden benches on three sides that are the standard to those found on the NYC Subway. Within this area are some modern blue metal attached to each other chairs that seem to be the current standard for Amtrak waiting areas. Hanging down from the ceiling are banners from the chamber of commerce and advertising local attractions (including Mohegan Sun Casino, not Foxwoods) although Amtrak has a thruway agreement (selling through tickets) with SEAT bus for Foxwoods Casino but not to Mohegan Sun. This Website is maintained and copyright © 2003-2013, Jeremiah Cox. This website is not affiliated with any transit provider. Please do not remote link images or copy them from this website without permission.